According to Chinese astrology compatibility, the Dog Rooster compatibility is most often a poor match at best, regardless of the circumstances. The Chinese zodiac sign Dog is a skittish and unpredictable sign that views itself as trustworthy, but has serious issues trusting others. The Dog tends to have inhumanly high standards of ethics and behavior, up to which even they cannot possibly live. This impossibility does not in any way impede the Dog from believing that it does, however. Anyone who does not manage to measure up to these standards is likely to be informed, at length, about their failure. The greatest challenge that a Dog man or woman will face is learning to relax. Life does not need to be so serious! Roosters have an eye for detail that many others might envy. However, the Chinese animal sign Rooster uses this keen and discerning nature in any and every way that it can to make absolutely certain that it is always the center of attention and power. A Rooster man or woman is motivated entirely by self and live and breathe control. The Rooster is domineering in all things and will not rest until it is in charge. On the upside, they are blatantly frank, open, and honest. They are not prone to playing games or deception of any sort. They would rather plow over an obstacle, proving once and for all that it wasn’t any sort of challenge, than circumvent it with subterfuge. Any Dog and Rooster friendship is likely to be sorely tested by the conflicting natures of the two Chinese horoscope signs. Both are strong of will. The Dog tends to believe that it is holding fast to its principles, when it may just be closed-minded and stubborn. The Rooster zodiac sign feels a constant compulsion to impose its will on its surroundings and has a nose for avoiding telling the truth. The Rooster male or female is more than likely to notice exactly the moment at which the Dog becomes dogmatically entrenched. Then they will call that out as nonsense. As might readily be imagined, this is the farthest thing from diplomatic as is possible. In bed, the dog and rooster are incompatible partners. Since their love compatibility is negligible, even sexually the rooster will try to be the boss. In all likelihood, things in a Dog and Rooster relationship will not get this far. There is, however, a small light at the end of this long and miserably dark tunnel. Both the Dog and Rooster soulmates are very loyal to those who they see as trustworthy friends. If the many, and often not minor, differences and obstacles between these two can be circumvented or overcome then the Dog Rooster compatibility can be a spectacular, long term success. Expect this to be the exception, rather than the rule in Chinese astrology compatibility. Furthermore, expect any platonic or romantic relationship between these two to require constant and herculean effort to create or maintain. Even while the dog male or female is dating a rooster, they will be intimated by their partner often leading to an immediate breakup. Despite all of the problems that other relationships might cause, a business partnership between the Dog and Rooster is one in which these two truly can shine and be tremendously successful. The Chinese Dog will not necessarily mind so much the Rooster wanting, or needing, to be in charge. The Chinese Rooster is motivated almost entirely by self interest, but it is worth remembering that it is often in their best interest to foster and reward loyalty. Dogs will respond strongly to this. They can take direction quite well and the odd mood swing can be dealt with swiftly by the Rooster. Both the Dog and Rooster in love tend toward blunt honesty. Each will always know precisely in the dog-rooster marriage, where they stand with the other. They will pass along this same frank diplomacy to everyone with whom they deal. 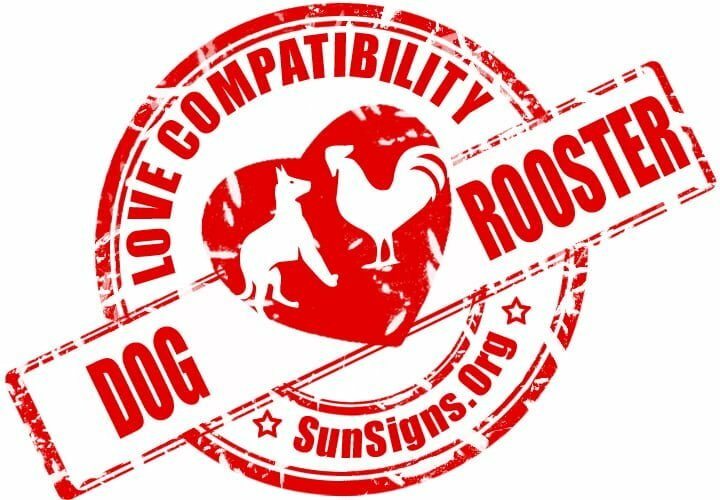 Dog & Rooster Chinese Horoscope Compatibility Rated 2 Hearts!